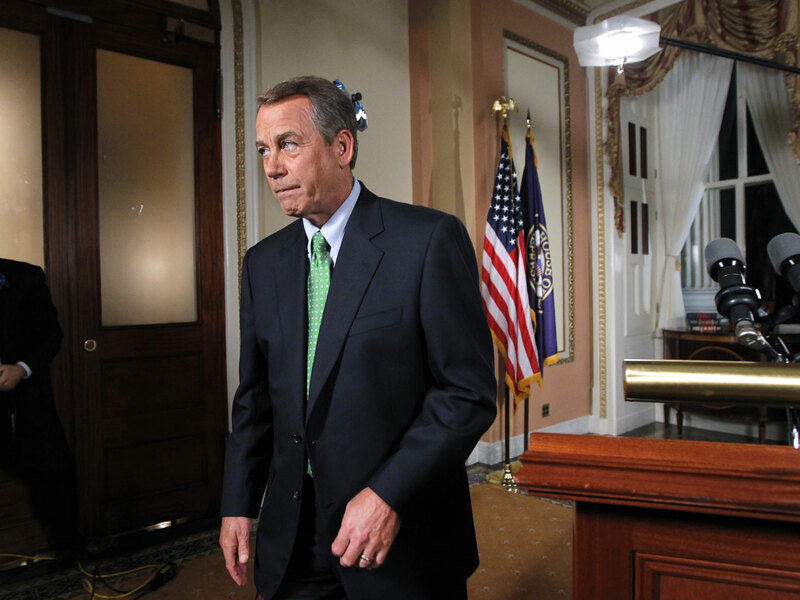 As House Speaker John Boehner left his ceremonial office building and was walking through the Speaker's Lobby surrounded by his security detail, he expressed his frustration with the ongoing debt debate gridlock. CBS News' Jill Jackson overhead the Speaker say: "I didn't sign up for going mano-a-mano with the President of the United States." His remark was dry in tone, and it was followed by silence as walked down the marble stairs and left the Capitol. Boehner is caught in the middle of a battle within his own party and with the opposition party, and he apparently didn't expect being Speaker would lead to verbal combat with the president in prime time. As reported earlier on Political Hotsheet, some within the GOP have come out against Boehner's latest plan on the debt crisis. In a statement Monday afternoon, Republican Study Committee Chairman Jim Jordan said he opposed the Boehner plan, adding that the "Cut, Cap, and Balance" plan passed recently by the House but rejected by Democrats "is the only plan on the table that meets (his conservative) standard." Jordan is one of 38 conservative lawmakers who earlier this year signed a pledge to vote against any debt increase that was not attached to an amendment to the Constitution requiring a balanced budget. While Boehner has said that he believes that there is still enough Republican votes to pass his own plan through the House despite objections from their more conservative members, that plan is still far away from what Mr. Obama and the Democrats are likely to get passed through the Senate. "I want you to know I made a sincere effort to work with the president to identify a path forward that would implement the principles of Cut, Cap, & Balance in a manner that could secure bipartisan support and be signed into law," Boehner said in his speech Monday night. Then Boehner went on to try and pin the blame for the gridlock on the debt talks on Mr. Obama, saying: "I gave it my all. Unfortunately, the president would not take yes for an answer. The president has often said we need a 'balanced' approach -- which in Washington means: we spend more... you pay more. The sad truth is that the president wanted a blank check six months ago, and he wants a blank check today. That is just not going to happen."